Arab terrorist wearing bomb belt stopped at Tapuach Junction near Ariel before he could attack. 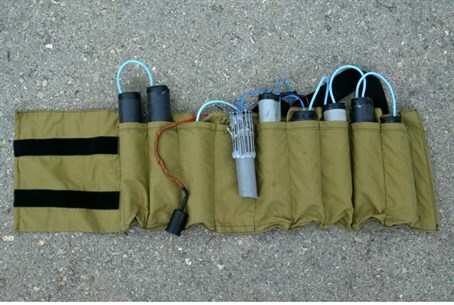 Security forces apprehended an Arab terrorist wearing a bomb belt at Tapuach Junction in Samaria, near the city of Ariel, on Friday morning. The terrorist raised suspicions by wearing a large coat in the hot summer weather. After security forces called on him to take off his coat and be checked, the man refused and proceeded to lay on the floor, reports Channel 10. When he finally removed his coat, he was found to be wearing a belt of explosives. A bomb disposal squad was called to the area to dismantle the explosives. The area was closed to car traffic by police following the incident, which caused no injuries or damage. "This is a serious rise in intensity in the attempt of the Palestinians to harm innocent civilians," said Gershon Messika, head of the Samaria Regional Council. "It's clear the Palestinians aren't for peace. The time has come for the Israeli government to recognize that, and rebuke whoever dares say that Israel is to blame for the peace talk failure." Those blaming Israel have reportedly included Palestinian Authority (PA) chief negotiator Saeb Erekat, as well as US President Barack Obama and US Secretary of State John Kerry. The location of the planned terror attack in Tapuach Junction is the same as a march held on Jerusalem Day this Wednesday, marking a year to the murder of terror victim Evyatar Borovsky Hy''d. Friends and family marched the site, where he was stabbed to death by an Arab terrorist a year ago, to "Evyatar Outpost," a community established in his honor nearby. Tapuach Junction has apparently become a target of terrorists, as in mid-April police officers foiled another stabbing attack. Police noticed an Arab man acting in a suspicious manner. Upon investigation, the officers found a knife in his pocket. An initial investigation revealed that the man intended to stab an IDF soldier at the junction. The recent foiled explosives attack comes after last Saturday three suspects in the Arab town of Jelazoun, located roughly between Jerusalem and Ariel in Samaria, were caught planting an explosive, reports Walla!. Two of the suspects managed to flee, although IDF forces managed to capture one, wounding him lightly by shooting him in the ankle as he tried to escape. The injured terrorist was transferred to the Hadassah Mount Scopus Hospital in Jerusalem for treatment. An additional bomb was found at the site, and was detonated in a controlled manner to avoid damage.